Financial services and property development group TA Enterprise Bhd will make its maiden foray into the venture capital business, focusing on the financial sector. Its managing director and chief executive officer Alicia Tiah said the venture was still in the infancy stage, adding that further details such as investment allocation would be announced later. "Part of the financing may come from the listing of our property arm TA Global Bhd. At the same time, we will beef up our corporate finance business," she told reporters after the group's extraordinary general meeting in Kuala Lumpur yesterday. On the long-awaited listing of TA Global, which has been deferred more than three times since last year, Alicia said the Securities Commission had approved all of its proposals. The listing plan was earlier postponed due to unfavourable market conditions. TA Global's listing is tentatively on November 30, which will also see its cash position reach RM135 million. "TA Enterprise's cash position after the listing of TA Global will total RM230 million provided all of its public and Bumiputera share portions are fully subscribed," said Alicia. After the listing, TA Enterprise will own 57.3 per cent of TA Global. On the group's outlook, Alicia said that much will depend on the stock market's performance as among its income sources is brokerage retail income. "When the market is rosy, so will our profits. Our brokerage business in Hong Kong is also giving us a good return due to its proximity to China," she said. On its hotel business, TA Enterprise executive chairman Datuk Tiah Thee Kian said the group is always on the lookout for good opportunities. "We are looking for opportunities all the time, especially for hotels in London and Vancouver, by either buiding one ourselves or through a joint venture. "It should be cheap and give us a stable income inflow. 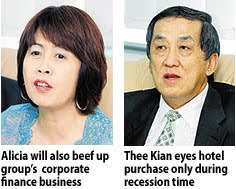 Those with a RM600 million price range are good for the company, and we will only buy during recession time and not during boom time," Thee Kian said. TA Enterprise owns the Coast Whistler Hotel in Vancouver, Canada, worth RM191 million, as well as The Westin Melbourne (RM390 million) and the Radisson Plaza Hotel (RM286 million) in Sydney, Australia. KUALA LUMPUR: TA Global Bhd, the property arm of TA Enterprise Bhd, hopes to acquire hotels in London and Vancouver within the current financial year ending Jan 31, 2010. TA Enterprise executive chairman Datuk Tony Tiah Thee Kian said the company had always been on a lookout for good opportunities and “now is a good time to look at acquisitions”. “We are looking at hotels in London. It may be a good fit for us. We are also looking at a hotel in Vancouver, by either building one ourselves or on a joint-venture basis,” he told reporters after the company EGM yesterday. “The criteria is, it should be cheap, well-located and give us a stable income flow. Those with a RM600mil price range are good for the company,” he said. He added that TA Enterprise only made acquisitions during recessionary periods. TA Global is slated for a listing on Nov 30. After the listing, TA Enterprise will have a 57.3% stake in TA Global. According to chief executive officer Datin Alicia Tiah, TA Enterprise’s cash position after the listing of TA Global would be RM230mil, provided all the offer shares were fully subscribed. “We can do more things with the fund, like nurture start-ups and beef up our corporate finance. These are areas we want to strengthen (our position in),” she said. On the outlook for TA Enterprise, she said it would depend on the performance of the stock market. “If the market is rosy, our profits will go up. “Hong Kong is also giving us a good return on brokerage income, given its proximity to (mainland) China,” she said. Malaysian properties have received a good response from overseas especially in the UK, says local property agent Zerin Properties. Its chief executive officer Previndran Singhe said the positive response has prompted him to set up a branch there by the end of this month. "British buyers are one of the top buyers in 2007 and top 2 buyers last year. There has been an increase in interest and surveys have shown that more and more British residents want to set up second homes in Malaysia," he said in a recent e-mail interview with Business Times. Zerin, which was formed in 2002, has offices in Kuala Lumpur, Sydney, Singapore and New Delhi. "Other than the fact that economic activities are now Asian centric, the weather and the less expensive lifestyle is definitely a pull for them. "Moreover, with Malaysia being the only country in Southeast Asia that allows freehold ownership of landed properties and that we are tier to real estate transparency with Japan at a fraction of the cost, we are indeed attractive," he said. Other reasons include the pricing levels of the properties and quality of the development. Singhe said the demographics of the type of foreigners wanting to buy second homes in Malaysia were "generally 40-50 years old, to invest or to have second home, hip and happening and wanted a superb lifestyle". "Malaysia is also familiar to them. It is an English speaking nation, prices are reasonable and of course, Malaysia Truly Asia," he said, adding that his company targets the elite to set up second homes here with assets from RM750,000 onwards. He said besides the British, Singaporeans are also keen to buy Malaysian properties. Foreigners favour buying their second homes in the Klang Valley such as the Kuala Lumpur City Centre (priced from RM1.5 million onwards), Mont Kiara (RM500,000 onwards) Bangsar and Damansara Heights (RM1 million onwards), Sentul Raya (RM450,000 onwards) and other selected locations like Country Heights and Gita Bayu. Singhe said Zerin plans to sell RM100 million worth of Malaysian properties per year as the market in London is picking up. Iskandar Investment Bhd (IIB), the catalytic developer of Iskandar Malaysia in Johor, said it will initiate talks soon with foreign business and law school operators to set up shop in EduCity, the 120ha education enclave in Nusajaya. Managing director Arlida Ariff said there are signs that the economy is recovering and now would be the best time to start talks with players in the education sector to keep EduCity vibrant. So far, the UK's Newcastle University of Medicine (NuMed) has agreed to set up a branch campus worth US$100 million (RM347 million) in EduCity. The NuMed campus, the first outside the UK, will start construction soon and open in 2011. IIB, which is majority controlled by Khazanah Nasional Bhd, is currently in talks with Maritime Institute Willem Barentsz and Maritime Institute de Ruyter, to set up a world-class maritime institute in EduCity. Arlida said IIB is also in talks with two other universities to set up engineering and hospitality schools in EduCity. "The plan for EduCity is to have multi-purpose campuses. We are looking at a minimum of eight universities," she told Business Times in an interview. EduCity, envisioned as 'A Community of Best Practices in Academia', will be developed in two phases under a 10-year plan (2008-2018). Development on the 49.12ha in the first phase has started. It features four universities with a combined capacity of 4,000 students. The second phase will see another four universities and this would double the student enrolment. Meanwhile, IIB has awarded a total of RM1.2 billion worth of infrastructure projects to local contractors since January this year to spearhead developments in Iskandar Malaysia. IIB had awarded WCT Bhd four contracts worth RM766.5 million to build roads, sewerage pumping stations and electrical sub-stations at Medini in Iskandar Malaysia. Depending on the amount of new investments coming in next year, IIB may call for new tenders but on a smaller scale. Property developer Glomac Bhd plans to buy 17.4ha of leasehold land in Ijok, Kuala Selangor, for RM9 million from Pertubuhan Peladang Kawasan Kuala Selangor. Glomac said it will finance the acquisition through a combination of internally generated funds and bank borrowings. The proposed acquisition is part of Glomac's strategy to extend its development in the Sungai Buloh growth area as well as Glomac's overall plan to increase its landbank in the existing Bandar Saujana Utama township. Bina Puri Holdings Bhd, one of the largest construction groups in the country, has won a RM185 million contract from Mayland View Sdn Bhd to build a 38-storey serviced apartment building in Jalan Kuching, Kuala Lumpur. It beat companies like the China-listed Beijing Urban Constructive Group Ltd and local construction and engineering firm Setiakon. The contract is the second biggest win for Bina Puri this year. In March, the group won a RM693 million job to build 2,000 houses in Brunei. The Mayland contract brings the value of new jobs in hand this year to RM1.4 billion, fattening its order book to nearly RM4.4 billion, with almost 60 per cent comprising unbilled sales. In a filing to Bursa Malaysia yesterday, Bina Puri said it accepted the contract from Mayland, a unit of Mayland Group controlled by Tan Sri David Chu, on September 25. The building, dubbed Regalia @ Jalan Sultan Ismail, has potential to generate gross development value of around RM600 million. It is scheduled for completion by early 2011. The group will be paid progressively and the contract will start to contribute immediately to its bottom line, Bina Puri group managing director Tan Sri Tee Hock Seng said. "This is our first win with Mayland. It was a tough bet and we went in very competitively with the intention to secure more work from Chu," Tee said in a telephone interview with Business Times. "Apart from Mayland group, Chu is the major shareholder in Hong Kong's Far East Consortium and Land & General Bhd. "We believe, in the longer term, we can get more contracts for new projects under the respective groups from Chu," Tee said, adding that Bina Puri wants to be less dependent on government projects, which take a longer time to be implemented.